Men’s Health Week takes place this month, from 11 to 17 June. This year the campaign is focusing on diabetes, which is an area that male clients of mine are showing a definite interest in and seeking advice on how they can help themselves stay healthy. Other common health complaints that men seek advice for include weight gain and obesity, backache, depression and anxiety, skin problems, erectile dysfunction and prostate worries. I generally recommend following the Mediterranean diet or the Low GL Diet as this way of eating has been shown in so many studies to be helpful for so many systems in the body. Eating a broad spectrum of vegetables is amazing for the body as each of the different colours have different mini-nutrients that target specific areas of the body. I also recommend drinking plenty of water. Most men drink less than the recommended amount and very often it can come in the shape of tea, coffee or beer. Extra fluid in your body allows your blood to flow easily and remain non-sticky. I encourage men to increase fluids gradually. There is no point in swigging two litres of water as it stresses your body and your bladder goes into overload. Magnesium – It is required for about 400 functions in the body and our soils are magnesium poor so plants etc. are not able to absorb what is not there. Essential fatty acids – Usually whole fish oils made from small fish. I am incredibly particular about this as fish oils really need to come from a good source and be processed in a particular way to ensure they remain stable and higher levels of the fatty acids EPA and DPA. Vitamin B-Complex – This is great for busy lifestyles, and for supporting brain and mood. If single B vitamins are required then it’s really good to have the whole B-complex to ensure proper absorption and utilisation. Cinnamon – This is great to have in porridge or drinks or sprinkled on fruit such as oranges where it’s really delicious. It’s a real natural sweetener and has the benefit of helping blood sugar. Chromium – This is such a useful mineral. It’s important in carbohydrate metabolism and it stimulates enzyme activity involved in the metabolism of glucose for energy. It also involved in the synthesis of fatty acids and cholesterol. Getting physical is very important to maintaining good health. That could mean walking, running, going to the gym, swimming, cycling, badminton, football or golf. The list goes on. Ensure you do it several times a week – if possible five times a week and for a minimum of 35 minutes. In my clinic I offer systematic kinesiology or manual muscle testing, which intrigues men of all ages. They want to know how it works and what I’m doing. Obviously the proof is in the pudding, when they go away and make some lifestyle changes and then start to feel the benefits. The clinical massage that I do is also very popular as it is so beneficial for joint pain and other muscular conditions. I find that homeobotanicals (liquid herbals) and Bach Flower essences are very popular with my male clients. The homeobotanicals are helpful for a number of conditions as a support alongside other changes. Many men have noticed improvements with mood, energy, focus, concentration, sleep and, one of my favourites to work with, hay fever. 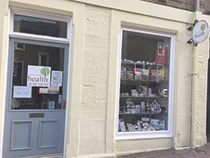 Down to Earth Health is based in Tower Street, Selkirk, in the Scottish Borders. Owner Rosemary Tarrant holds several qualifications in massage, homeobotanicals and Systematic Kinesiology. Her shop stocks a wide range of vitamins, minerals and supplements, healthy snacks and drinks plus much more.